I think an overriding sense of what we are striving to create here is a space where alternate ideas, concepts and ultimately products in our online shop can be shared and supported. So with this in mind, I became fond of the project of Lam Quang and Kestrel Gates this morning who run their own little independent venture dedicated to creating handmade lights and lamps for around the home. The couple have built their work around their family life, as you will soon see in the video below, everyone gets involved in one way or another, young or old the house is always open to experimentation and creativity. Lam, who initiated the HiiH Lighting project, began experimenting with handmade paper in the late 1990’s which forms a key element of the lamps they create today. 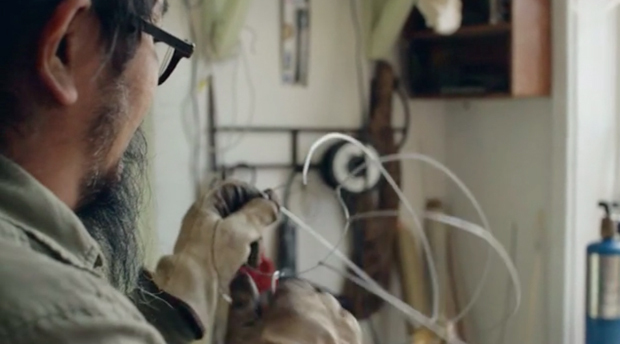 Eight years later Lam opened a gallery in the art district of Portland, Oregon highlighting his handmade works that had begun to include wire and later harness a function as indoor lamps. It wasn’t until 2004 that Kestrel got involved, bringing her background in preforming arts and drawing to complete the designs that you’ll see in the video below. There is a little story to how this all came about but I’ll let Lam explain when you press play. What I really enjoyed about this video was we get to see a couple of processes that you don’t come across very often in modern times. My favourite being the paper making, which I’ve never tried myself but I’m really intrigued by after watching Lam. I’ve seen quite a few washi paper making films and videos before as Naoto Fukasawa and his collaboration with Japanese Washi paper maker ONAO made us curious to learn a bit more about this. However, this was on a much larger scale than what we have here, so I guess Lam has the capability to experiment a bit more and use different combinations of pulp to alter the lanterns. This is quite a key element to what HiiH do because they’re always having to adapt to entertain clients who want custom designs. In the past they have created work for a rather diverse range of individuals, be it a friendly neighbour who just wants something quaint and handmade for his front room or a commission for a large restaurant, office or school. Delving through their website I was greeted by so many intriguing and individual designs, It got me thinking what would I create if I was working in this way. Maybe I’ll have a go myself over the weekend. So whilst I ponder this why not head across to their page after watching the film and see what you think for yourself.